now some folks may think i have lost my tiny mind and i am 'a-okay' with that, for Mr Spell Checker has mocked me and Darren Dictionary has informed me in his very knowledgeable voice, that the word 'dumptie' does not exist. ever since i stumbled upon a 'dumptie' last week i have wished to fill my shed with them, i have of course used great willpower and only crafted three so far. this elongated 'dumptie' waiting for two bods who like each other to share, reminds me greatly of one i saw a while ago on sfgirlbybay, originally the bench came from Anthropologie. through some clever detective work (whilst wearing a deer stalker hat) i found the image pinned on Victoria's spiffy pin board. (not bad eh for a monday morning). 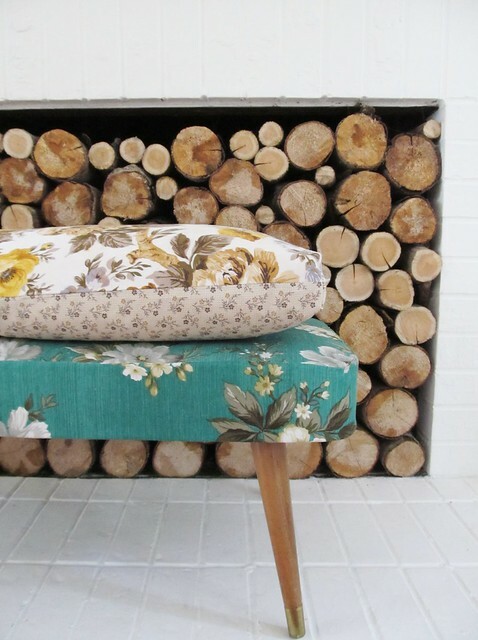 i am thinking any lone stool and any lone cushion could easily no longer be lonely if we spent our days wisely in our own sheds, pairing them all up. 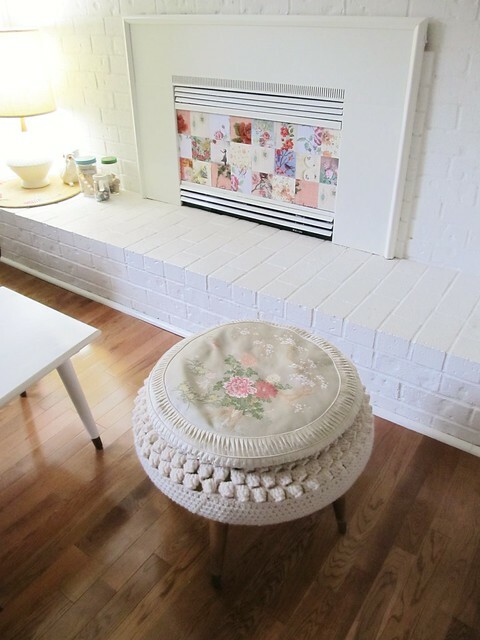 it could be as easy as finding one little wooden stool and one little round cushion you already have and introducing themselves to each other (or square, i have nothing against squaries so do not leave them out). it could also be a case of, the need to add a 'dumptie' to you life, is the perfect excuse to go on a thrifty jolly. 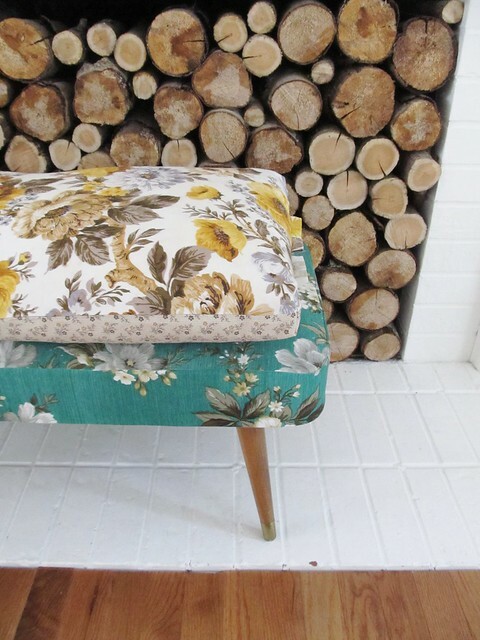 searching for a little stool or perhaps a small side table with legs looking like they could do with being chopped down. 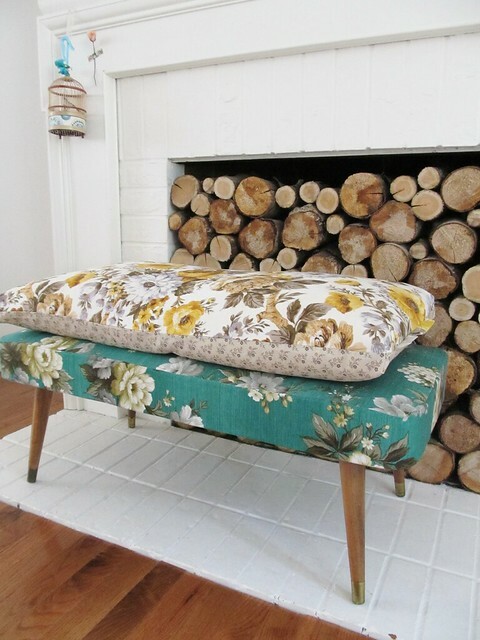 then bringing home your spiffy find, giving it a lick of paint and then spending a few happy hours stitching it a cushion top to make it feel loved. after which i am quite sure, you will be having to check regularly on your 'dumptie' and its condition staying maximum 'dumptie-ness' for if my 'dumpties' are anything to go by, they will attract a lot of attention from clan members and their derrieres. and so i think it only fitting, as the word 'dumptie' is of a greatness level with any other word i know like 'peachy' and 'spiffy' and 'crappity crap' that those who have a dottie angel book in their possession may wish to add a little note to the back pages in the fine and dandy section, 'a dottie angel dictionary'. i am thinking you may be able to pencil it in or scribbling it on another little piece of paper and sticking it in might be rather nice. I wish our thrifts had such stools to make a dumptie. I would love one to prop my feets upon whilst crocheting. Yes I do think 'dumptie' should not only be adopted but celebrated. Being someone displaying definite lumpy bumpiness I whole heartedly agree it is a word that we all need. Long live dumpties! Just off to pillage one off someone to have ago myself. a dumptie addendum! love it. 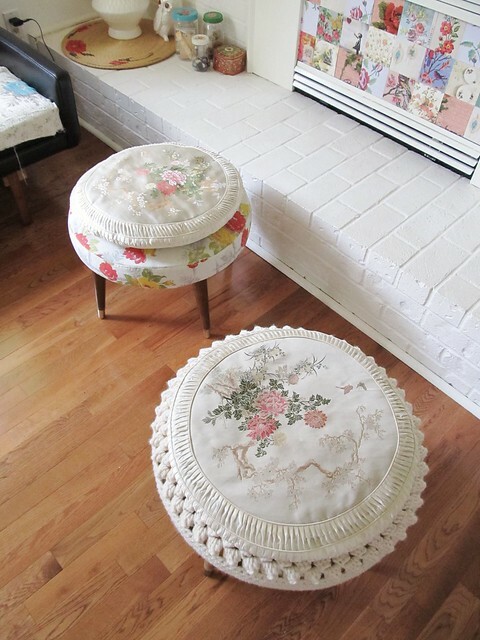 I am wondering, did you make these stools? If so, where did you get those lovely long leggy legs? Thanks for sharing! Your blog is eye candy! why your dumptie is just positively lovely and I must find one for my own abode! OH how lovely! I feel inspired to make many a dumptie and spread them around my home. Such great fabrics too! I'm immediately adding dumptie to the dictionary in the back. :) Thanx for making the day, just a little more colourful! Lovely word...and I adore the mid century one...excellent job!! i couldn't help but laugh out loud. you can be soooooooooo funny. Does this mean that Humpty was actually not an accident-prone egg-man, but a piece of furniture? I have a case of Monday confusion. Can I pls move in with you? Love them. How on earth do you keep everything so white? Do you whitewash everyday or just photoshop your pictures??? Tif, these are darling! I just picked up a sad little stool, have painted her up and am trying to decide how to dress her up. She's a squarey. 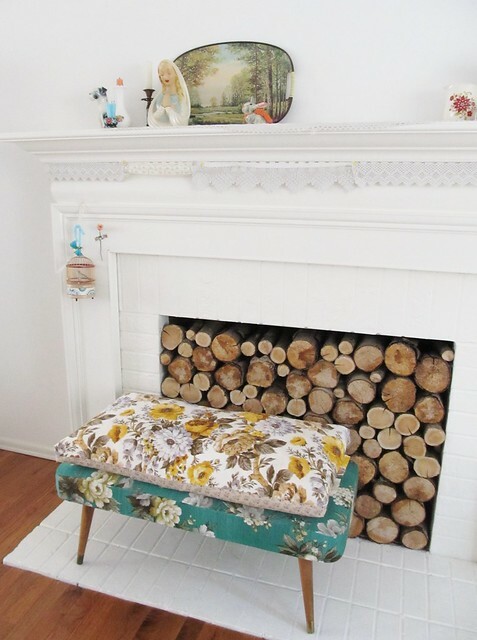 I am also curious about what you have covering your fireplace opening....is this some sort of patchwork and how is it attached or what is it made of? I love your blog so much! So much prettiness here with a wonderful sense of humor...I can hardly contain myself in my enjoyment. :) Stopped by for the first time last week at the suggestion of the lovely Stephanie Levy, and so glad I did! I cant imagine where Humpty would of been if he hadn't had his Dumptie! as for the fireplace, it is an unused gas insert which needs to be pulled out and sorted. whilst home Our #1 noted, during the summer, she could not believe i had not covered it up yet due to its non-pretty ways. there followed an evening of cutting up squares of postcards and magazine pullouts to make a patchwork quilt of paper. (some postcards are from my lovely buddy Jane from ATLITW). Ooooh my front room need a dumptie or two! I adore your new lumpy dumptie. You are right. I am quite lumpy and quite lovely. I am sure of it. "some of the best things in life have a little lumpy bumpy-ness to them" - how right you are, Tif, how right you are. I adore your dumpties and just days after seeing them, I have found my own! I have posted my 'before' picture and hope to have the energy to have an 'after' soon. These are gorgeous - such a clever idea, and practical, too. I don't suppose you know the name of that Sanderson fabric? It would make amazing curtains for my dining room! alas KatieP, i do not, they were vintage sandersons curtains when we found them, one was in bad shape, hence snipping it up!